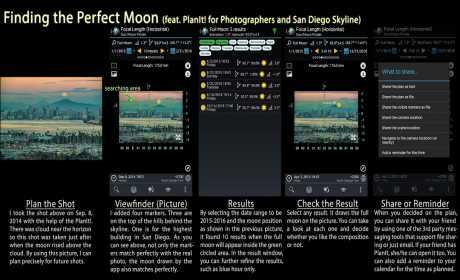 This is a special call to landscape photographers, travel photographers, nature photographers and those who are interested in night photography, city photography, time-lapse, star-trails, milky way or astro-photography: look no more, this is the ultimate app for you – the PlanIt! Ansel Adams dedicates the beginning of his first book “Taos Pueblo” to visualization. He introduced the idea of “previsualization”, which involved the photographer imagining what he wanted his final print to look like before he even took the shot. Of course there are many great photos which were taken impromptu. However, for landscape photographers, being able to previsualize the scene before going there will greatly reduce the chance of being caught unprepared and will greatly increase the chance of getting better shots. Photographers use various tools to help them pre-visualizing the scene. Nowadays, many of those tools are phone apps. PlanIt! 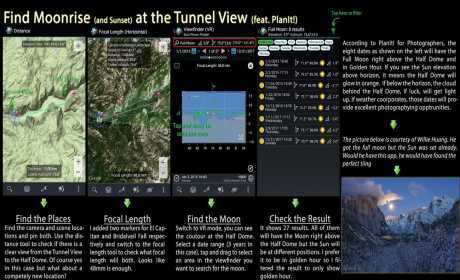 is all-in-one solution that is designed to leverage the map and simulated viewfinder technologies to provide the necessary tools for photographers to pre-visualize the scene in combination with the ground subjects and the celestial objects such as the Sun, the Moon, Stars, Star-trails and Milky Way. 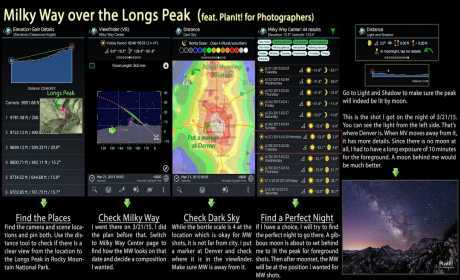 In a single app, we packed it with features – from location scouting such as GPS coordinates, elevations, distance, elevation gain, clear view, focal length, depth of field (DoF), hyperfocal distance and panorama, to the Ephemeris features such as the sunrise, sunset, moonrise, moonset time and direction, twilight time, special hours of the day, sun/moon finder, major stars, constellations, nebulae azimuth and elevation angle, star trail planning, time-lapse calculation and simulation, milky way searching, exposure/ND filter calculator, light meter, bulb timer etc. All the information are either represented on the map as an overlay or visually presented in a simulated viewfinders (VR, picture, or streetview), just like you look through your camera’s viewfinder.